Few magazines remain and on display are all ten complete sets of the rarely seen publication. Issued in a box, Aspen was one of the first multi -media magazines and became a time capsule of the period. It was conceived by Phyllis Johnson, a former editor for Women’s Wear Daily and Advertising Age, and inspired by Aspen, Colorado, a popular ski resort at the time. Each distinctive issue had a different editor and designer who took complete control of the magazine. On show is Andy Warhol and David Dalton’s Pop Art issue including a detergent box cover, and a special British issue with British Knickers, a sewing pattern by fashion designer Ossie Clark, souvenirs found by Peter Blake and The Lennon Diary 1969, a diary of the future written by the Beatles musician. 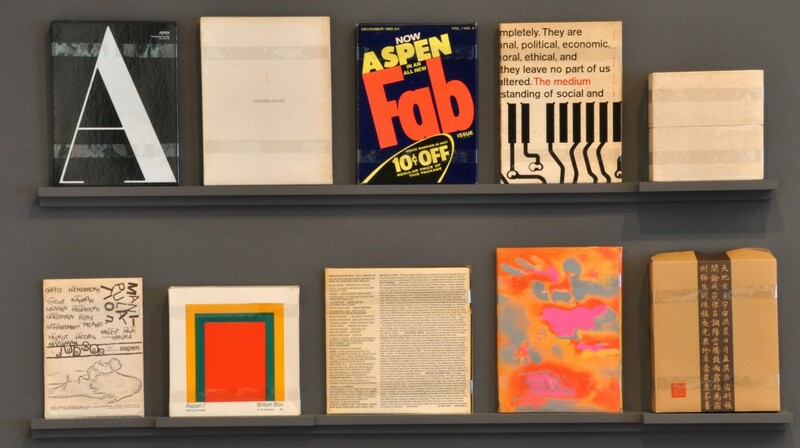 Other highlights include films by Robert Rauschenberg and Robert Morris, recordings by Yoko Ono, John Lennon, William S. Burroughs and Marcel Duchamp, essays by Roland Barthes and Susan Sontag, and a psychedelic issue edited by Angus MacLise, the original drummer from the Velvet Underground.